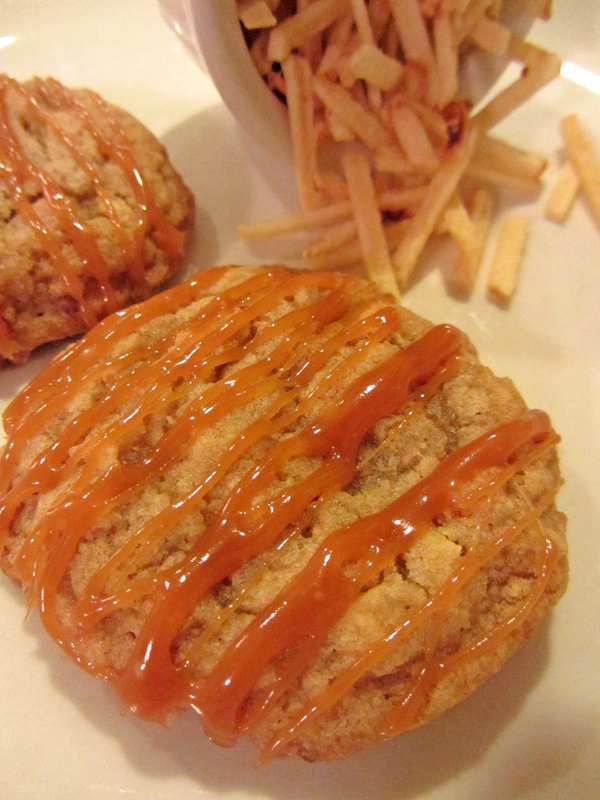 Chewy, brown sugary cookies with a subtle potato stick background, topped with caramel. It might sound strange to put shoestring potatoes into a cookie, but they really work. Think, caramel corn, but different. This is a unique and tasty cookie - give it a try! *Melted soft caramels can be used instead of the homemade caramel. 1. For the Cookies: preheat the oven to 350°. Line baking sheets with parchment paper. 2. Place the potato sticks in a ziptop bag and seal the top. Use a pounder (or other flat, heavy object) to break the sticks in to pieces (not into powder). 3. In a medium bowl, whisk together the flour and baking powder. Stir in the potato sticks. Set aside. 4. Combine the sugars and butter in the bowl of a stand mixer. Beat until light and creamy. Add the vanilla and egg. Beat until well blended, stopping to scrape down the bottom and sides of the bowl as needed. 5. Add the dry ingredients to the bowl. Beat on low speed until the dry ingredients are just incorporated. 6. Scoop about 2-tbsp balls of the dough onto the prepared baking sheets, leaving 2" between each. 7. Bake for 8-10 minutes or until the edges are golden brown. Transfer the baking sheets to racks to cool. Allow the cookies to cool on the sheets. 8. For the Caramel: have all of the ingredients ready - the caramel comes together quickly. Stir the sugar, water, and corn syrup together in a small saucepan. Wash down the sides of the pan (a pastry brush dipped in water works well). Cover and turn the heat to medium-high. Cook until the mixture comes to a boil. 9. Uncover the pan. Cook, swirling the pan occasionally, until the sugar mixture turns light amber. Immediately remove the pan from the heat. 10. Stir in the cream. Stir in the butter. Stir in the vanilla. 11. Use a spoon to drizzle the hot caramel over the cookies. Allow the caramel to set. Serve!